Dezeen promotion: Karim Rashid has collaborated with Krosno to create Sakred, a "simple and timeless" collection of cylindrical and cone-shaped glassware. Sakred forms the first collection within glassware manufacturer Krosno's new sub-brand, Krosno D'sign, which invites the "best-known creators of global design" to develop glassware in their characteristic style. Rashid's designs celebrate "the pure geometry of the cylinder and the cone", combining the shapes in various ways to transform a series of everyday objects into ornaments. "I believe in simplicity, and especially for functional democratic objects of everyday life," explained Rashid, Krosno D'sign's first collaborator. "My first collection is geometric and sturdy, very functional but with a sensitivity to balance, proportion, and colour." Sakred comprises a set of drinking glasses, including ones specifically for wine, champagne and cocktails. There is also a carafe, two different sized bowls and vases, as well as a candlestick and a cake platter with a lid. Functionality was Rashid's priority when designing the collection, and they are complete with his trademark use of vibrant colours – made with a mix of green, yellow, blue, pink and purple glass. "Functionality must come first. But I am also trying to create design where the human experience is elevated, simplified, engaged and inspired," he added. "There have been billions of cups since the dawn of time. I cannot reinvent the object but can imbue it with contemporary poetics." 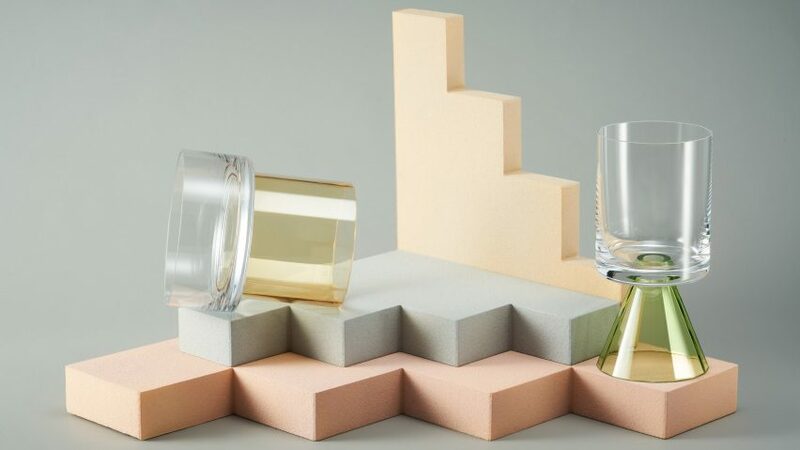 Rashid has also collaborated with Krosno on the second collection for Krosno D'sign, which he describes as a "far more sensual exploration" of a traditional wine glasses. Named Luck, it is based on a four-leaf clover. "I think Krosno and I share a philosophy that embraces fluid movement and forward momentum, reimagining the sculptural possibilities of glass with an eye toward the future," he added when reflecting on the collaboration. "They are very communicative and progressive thinking so together we were able to create designs that represent the now." The brand was launched at the Ambiente 2019 International Fair on 8th February 2019, when Rashid presented the collection. Photography is by Tomek Albin.